SUMPTUOUS SOUPS ARE SO SATISFYING! 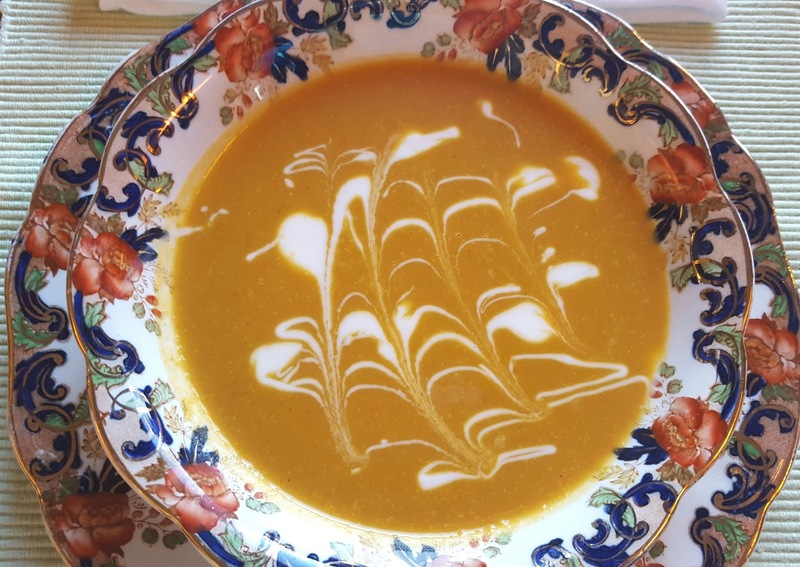 I made this gorgeous soup as a first course at our Christmas feast, but it would be good any time of year. It is equally yummy both cold or hot---think cold Hungarian Borscht! Heat oil in large saucepan over medium-low heat. Cook onion, potatoes, celery, and garlic, stirring occasionally until veg are crisp-tender; about 10 minutes. Add broth, bay leaf, salt, thyme, and pepper and bring to a boil. Reduce to a simmer and cook 20 minutes. Add beets and continue to simmer until veg is very tender; about 10 minutes more. Remove from heat. Discard bay leaf. Puree soup in small batches in a blender until smooth and return to pot. At this point you may refrigerate overnight and finish next day. If you are doing so, return cold soup to saucepan and slowly re-heat. Stir in milk, cream and lemon juice. Stir to combine and heat until warmed through. Garnish and serve. I like this method of cooking beets because they are a pain to peel raw. Once roasted the skin practically rubs off. Preheat oven to 425 degrees. Wash and dry beets thoroughly. Cut off tops and bottoms. Cut into quarters (skin on) and place on baking sheet. Drizzle a little bit of olive oil over beets. Salt liberally and rub the oil and salt into the beets. Bake for about 15-20 minutes or until beets are just tender. Let cool. Remove skins and chop into 1/2 inch pieces. drag a knife through to make the design. 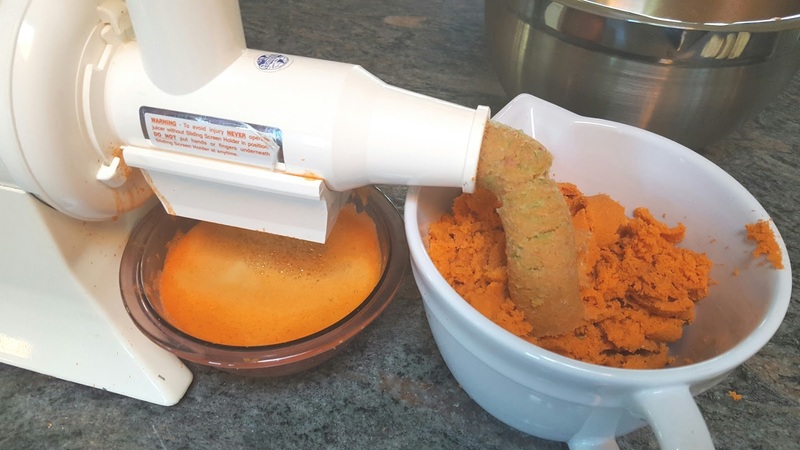 I have given you this recipe in the past and one of the things I love about it is that you can keep changing it up to give a slightly different flavor or texture. 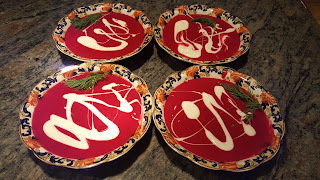 As with the Beet Bisque this soup is good either cold or hot. In this case, I used the original recipe (above link), but added vegetable/fruit fiber into the broth that I had saved from a 3-day juice fast my husband and I did recently. 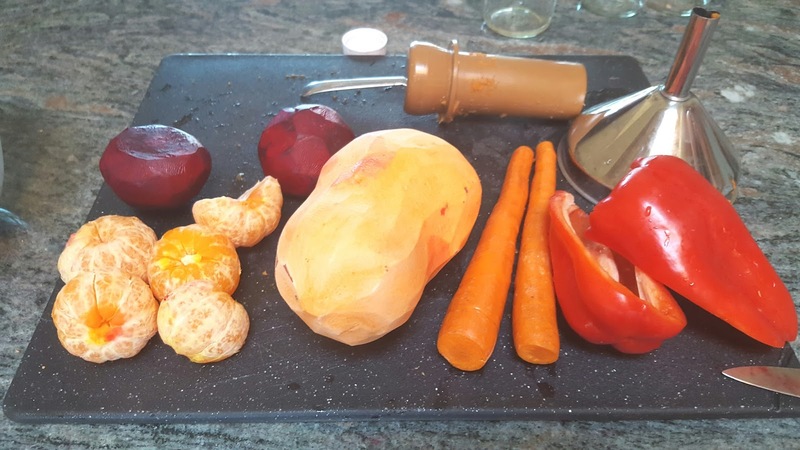 This combo of fruit and veg is from Joe Cross's 3-day Juice Cleanse called, Sunset Blend Juice. It was truly delicious and the pulp is what I added to the Carrot, Coconut, Curry and Ginger Soup. It seems such a waste to throw out all that good vegetable matter so I froze some for future soup stock and to another batch of pulpy fiber I added unflavored gelatin and turned the fruit/veg fiber into a cold vegetable cake. The cakes were surprisingly good! 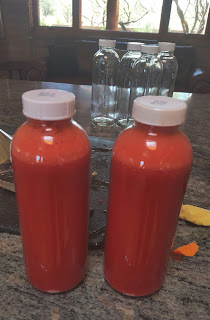 What I learned in juicing for the first time is the combination of ingredients is not that important as long as you mix some sweet (beets, carrot, apples, oranges, etc.) with not so sweet (celery, kale, spinach, etc.). And, fresh ginger root was a nice addition to all recipes. Here is the Sunset Juice Blend all bottled and ready to drink! Joe's Breakfast Juice: Carrots, green and red apples and ginger. Delicious! Look at all that fiber! Both Jerry and I felt great after Juicing for 3 days, but we were hungry for real, solid food! for another glimpse into my kitchen!